A classic two drawer cocktail table from outside, an adventurous hideaway from inside, this cocktail table by Lexington Furniture will cover your living room’s need for storage in great style. 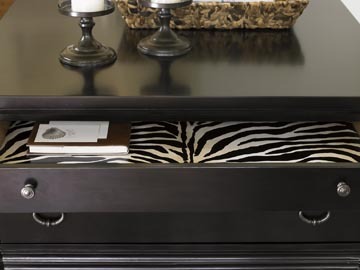 A hand-painted Zebra stripe inside the drawer gives the Greenport Cocktail Table a hidden wild streak. The design is available in either the 800 Shell or 801 Midnight finish. Dimensions: 40¼W x 20H x 40¼D in. For more information on finishes and shipping costs, please contact us.